thank you for having had the courtesy to acquire these songs. 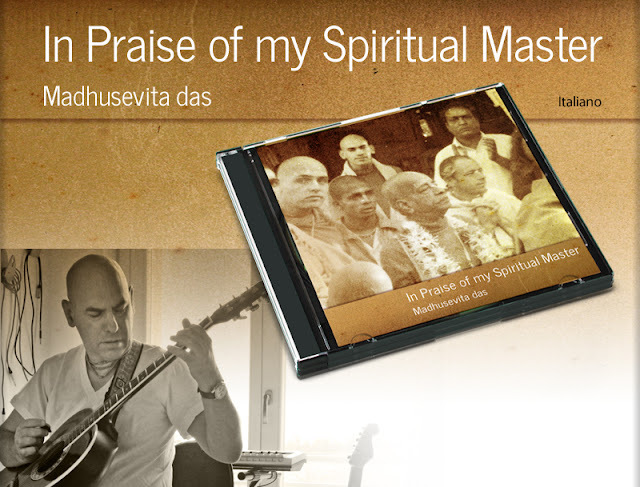 Since I joined the Hare Krishna Movement, in 1973, I had cultivated the desire to offer a few songs in praise of my Spiritual Master A.C. Bhaktivedanta Swami Prabhupada, the Founder Acarya of the International Society for Krishna Consciousness. Actually one of the songs had been written right at the time of my joining the Movement, but for nearly four decades I practically did not have the time or the concentration to practice or do anything in relation to music. A short while ago, realizing that my body is nearly 60 years old, and that my senses will soon become too weak to do anything, I resolved to try to put something down, and here is the result. For the recording I just used GarageBand and very simple instruments, and I sung and played two or three times at the most for each song. The devotees of the Lord are very merciful, though, and they can extract the nectar of rememberance of Srila Prabhupada’s Lotus Feet even from an however mediocre performance like mine. Thank you. calling them “family” and “kinsmen”, gliding with them down to hell. search for cosmic mozzarellas, soups, black holes or primal life. When we think we made some progress, how complacent we become! going so far even to judge You, we become the lowest fools. Only way to be protected – to become attached to You…. just carry on with life. by Krishna’s grace I took shelter of You. wouldn’t allow me to, how inconsistent was my love. You are not really hard to love, You are not really hard to love, Srila Prabhupada. Wish that all may realize, how to love You is easy and nice. the joy here in Mayapur Dham, fills up the land and the sky. the roads are spotlessly clean, and the room has been duly prepared. all our lives are fulfilled ‘cause of Srila Prabhupada. and then we follow the car till it reaches the Candrodoya Mandir. and He walks with his lion gait filling up with joy our hearts. we all move towards the altar where He offers His obeisances. our ecstasy knows no bounds anymore. then gives himself a vacuous smile right in the mirror. he sheds blood, sweat and tears to give his contribution. upon his death he’ll be going down to hell. that can cut through the layers of his degradation. Duratma is stunned – what happens in his heart? granted him back his immortality. because he got the association of Mahatmas. Duratma saved, duratma saved, by the books of Srila Prabhupada. And if He hadn’t been so kind, I could be born a dog or a swine. long pointed nose, hooves and a tail – which kind of birth no one can tell. amongst the crowds another face, going down to hell at a breathless pace. please allow me, to join You again. and if I do sincerely try to serve you and love you, then I am sure…. all the bums are giving way to the sweet angelic Saint. His compassion puts to rest birth, old-age, disease and death. Lower East Side, where revolution is divine. low-class high-class we don’t mind, this vibration makes all free. portoricans, hippies, blacks are submerged with Holy Names. Tompkins Square Park, you’ve now become an Holy Dham. “Stay High Forever” please, but free from L.S.D. no one compares to Him, to Krishna is the most dear. Jay Prabhupada, now love of God is in our hearts.